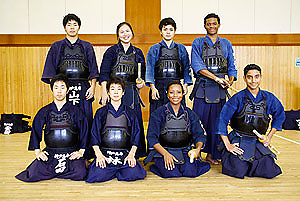 Emily Wang, Geovanni Salcedo (standing, second and fourth from L), Idara Ukpanah, and Shadi Al-Tawrah (kneeling, third and fourth from left) study kendo, the Japanese art of fencing. A dozen students from Westside High School did their part to improve international relations this summer when they participated in a program sponsored by the Japanese Ministry of Foreign Affairs. The students spent ten days exploring that island nation in July through the Kakehashi Project/Bridge for Tomorrow, a program designed to cultivate a more positive relationship between the U.S. and Japan through youth cultural exchange. While there, Westside students stayed with host families and learned the Japanese arts of fencing (kendo), archery (kyudo), paper folding (origami), and the tea ceremony (chanoyu). They also visited the Kobe City College of Technology, where they experimented with liquid nitrogen, discussed a solar car with the students who built it, and even took part in a hovercraft riding trial. All of the Westside students described the trip as a once-in-a-lifetime experience. Senior Kaylynn Davis (right) experiments with string art during a class on origami, the Japanese art of paper folding. This entry was posted in High Schools and tagged Japan, Westside HS on August 1, 2013 by HISD Communications.